Snakes, like all reptiles, need the warmth of the sun to speed up their metabolism and help their digestion. However, where they choose to do this can be a bit odd, in this case a Northern Water Snake has chosen a fairly thin branch overhanging a pool of swirling water. 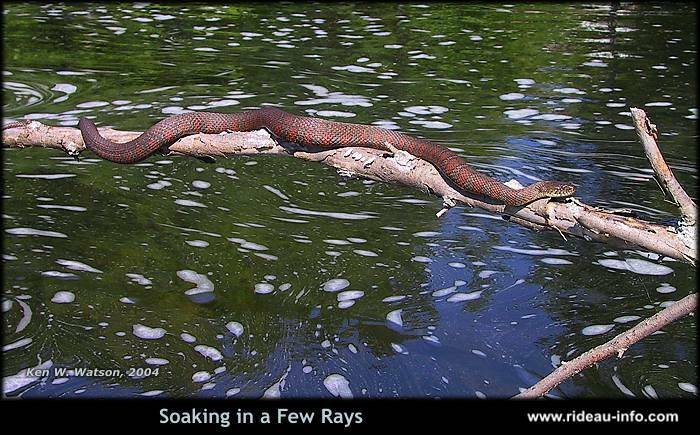 I was out canoeing with a friend who first spotted the snake. We paddled the canoe in close, allowing me to take the photograph within a couple of feet of the snake. It didn't seem to be particularly bothered by our presence. I took several photos and then we paddled away, the snake continuing to enjoy the morning sun on its perch.